This guy with an alien-like eye is a Moina sp., possible M. micrura, and I appreciate the help of photomacrography.com community in ID help. It has the weirdest eye I've ever seen and it reminds me of Starcraft and Zergs. Though I doubt the designers of this game ever seen pictures of water fleas or their eyes. The pictures are taken in polarized light and I made it a long time ago (it's a stack of 12), though I thought it was ugly and not worth displaying. The flea has a winter egg developing inside. They form resting eggs that are designed to withstand really nasty conditions such as freezing. Water fleas normally form them in autumn, which makes sense. Most of the time fleas reproduce asexually as females use parthenogenesis and they "make" lots of female clones. In the same way females can produce males and that happens when the conditions get worse. And as a result of mating, resting eggs appear.Yes, reproduction among invertebrates can be weird. The egg is on the right side of the flea on the image. 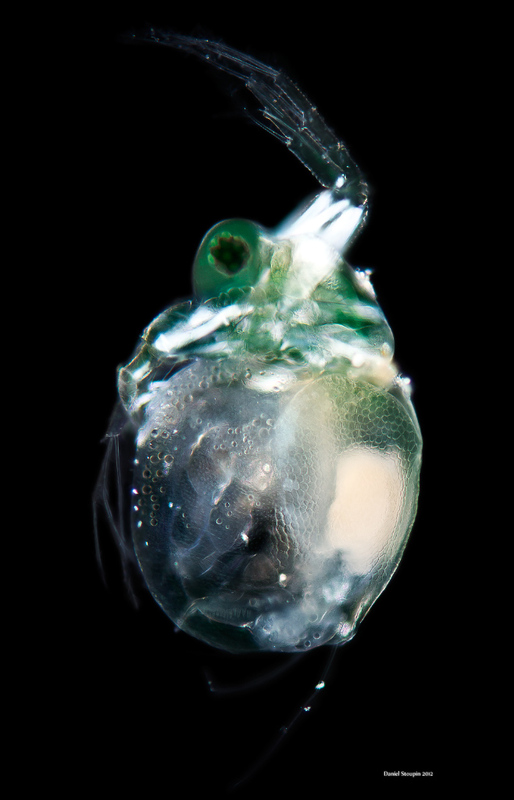 Aside from that, you can see some muscles that beautifully illuminate the whole crustacean from inside. Polarized light is awesome and I never stop being fascinated by what it does. Unfortunately, I couldn't capture the muscles that move the inner parts of the body, they were perfectly visible, but not when the flea stopped moving and I had time to make a stack. The image below is a less perfect stack that does not include antennae. I'll be looking into my collection again to find other "disqualified" images.